Union Minister and BJP leader Smriti Irani has claimed in a twee that Congress’ Priyanka Gandhi Vadra has ‘insulted’ former PM Lal Bahadur Shastri by garlanding the leaders bust with the garland she had worn. 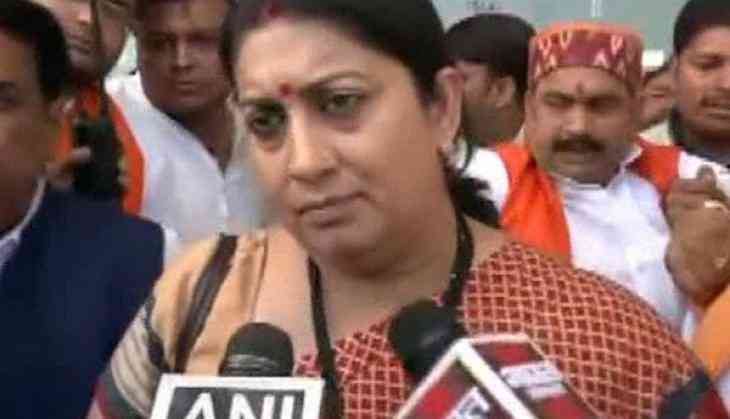 Irani, who took a dig at the Gandhi scion, might contest from the Amethi constituency, which is the home turf of Congress president Rahul Gandhi. Union Textile Minister tweeted a purported video claiming that Priyanka Gandhi has ‘insulted’ ex PM Lal Bahadur Shastri. In a tweet in Hindi, “In her "arrogance", she chose a used garland, clapped, waved her hands and left after insulting Shastri,” alleged Smriti Irani. Since Priyanka was appointed as the General Secretary of the UP East, she has not been this valiant in attacking PM Narendra Modi. But, on this poll tour, she directly took upon the BJP stalwarts and aimed direct allegations at them. Smriti Irani will be in direct competition with Priyanka Gandhi’s poll campaigning in UP East, which holds the key to Lok Sabha poll.